Bitterly cold air continues to affect New Jersey Friday with a wintry progression of snow, sleet/freezing rain in the forecast from Friday night to Saturday. Good morning, New Jersey! Or maybe that should be... Good morning, North Pole! It is a bitterly cold December morning, with temperatures in the teens. The vast majority of wind chill ("feels like") temperatures are hovering in the single digits. Brrr! Meanwhile, we continue to closely watch a chance for snow, then wintry mix, then rain from Friday night through Saturday. I've seen other forecasters describe this system as a "bad, damaging, major winter storm". Oh, please. Snow totals may pop over 4 inches in NW NJ, and ice accretion could become a problem. But a major "bread and milk" storm this is not. Our one saving grace for Friday morning? Winds were somewhat lighter than expected overnight. And they will continue to decrease through the day Friday. You'll still want to bundle up tightly, in layers, to protect yourself against this unseasonable cold. Wind chills are below zero in spots, right on the edge of "dangerous cold" - frostbite can affect exposed skin within a half-hour. "High" temperatures on Friday afternoon will be limited to the mid to upper 20s. Clouds will increase steadily after about 11 a.m.
Our next storm system will start to press across the Delaware River by about 10 p.m. Friday night. Snow showers will then spread across the Garden State overnight, with snow intensity and spread increasing after 4 a.m. Saturday. Our deep freeze has thoroughly frozen the ground, so any snowfall will "stick" and begin to accumulate immediately. Our latest forecast is very similar to our previous forecasts, with two important tweaks. The southern coast of New Jersey (Ocean, Atlantic, Cape May, and Cumberland counties) may not see much (if any snow). Meanwhile, the chance for a period of ice accumulation has increased for the rest of the state. Once again, the frigid ground is an important factor, leading to a higher risk from freezing rain and ice accumulation sometime Saturday. Even a few droplets of freezing drizzle can form a super-slippery glaze of ice. As Saturday morning progresses, warmer air will begin bubbling up from the south, enacting a change from snow to a wintry mix of sleet/freezing rain and then all rain. As I said in an earlier blog post: the timing of this changeover will directly impact how much SNOW accumulates. I will add to that: the speed of this changeover will directly impact how much ICE accumulates. The biggest impact from this winter storm will absolutely be travel. From Friday night through Saturday midday, roads will become icy, slushy, and/or wet. Sidewalks, steps, and driveways could become treacherous too. In parts of the state (think north), shoveling or even plowing may be necessary. Flight delays will likely affect area airports. However, keep in mind... As temperatures warm and precipitation changes to rain, the snow and ice will either melt or wash away (eventually). So conditions will automatically improve. Eventually. Along the south coast: Mostly rain. Little to no snow expected. 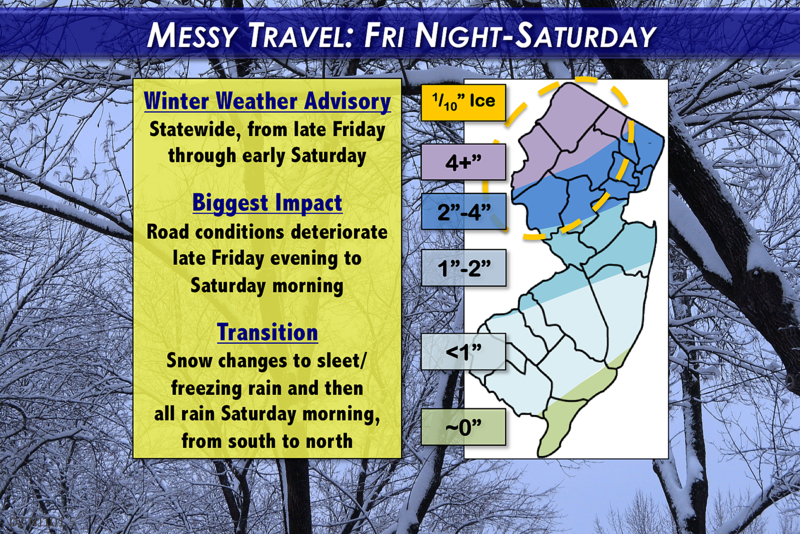 Interior central and southern New Jersey: Transition from snow to rain by 8 a.m. Saturday. An inch or two of snow accumulation and a trace of ice possible. Central and northern New Jersey, along and NW of Route 1: Transition from snow to wintry mix to rain should happen by 10 a.m. Saturday. 2 to 4 inches of snow and up to a tenth of an ice of ice possible. Higher elevations of North Jersey (in and around Sussex County): Transition from snow to wintry mix to rain will hopefully happen by Noon Saturday, but could occur later. About 4 inches of snow and up to a tenth of an ice possible. The entire state of New Jersey falls under a Winter Weather Advisory from Friday night through Saturday. An advisory is not as urgent or severe as a warning, again suggesting this is not a "major" storm. It does, however, advise that travel conditions may be quite poor due to a combination of snow, sleet, and freezing rain. But the National Weather Service hasn't issued one advisory to cover New Jersey. They've issued SEVEN. Temperatures will continue to warm through the weekend, reaching the upper 40s to lower 50s on Saturday afternoon, with tapering scattered showers. Sunday peaks at near 60 degrees - a far cry from Friday's mid 20s! Another round of rain will sweep from northwest to southeast during the day Sunday. Behind that rain? Another cold front, and another cooldown. Monday's weather will be quieter, but cooler with high temperatures only in the mid to upper 30s. It's a busy weather weekend. And, as always, we will continue to keep you updated regularly, both on-air and online.